Mini Menus are a classic marketing weapon for a reason. They are an efficient way of getting valuable marketing messages in both images and text directly into the hands of potential customers. Mini Menus allow customers to quickly get a feel for products or services, while also finding answers to many of their initial questions. 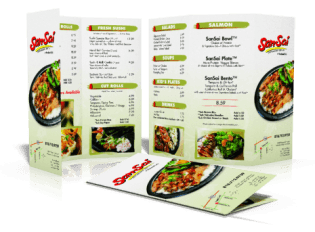 Mini Menus are great to include in a sales kit or pass out in high-traffic areas. The most common order options are 4" x 10" before folding on 100# Gloss Text paper. Almost always, Mini Menus are printed full color on both sides (4/4) and are coated AQ 2 sides. The most common folds are Tri-Folds, HalfFolds, Z-folds, Double Parallel Folds, Roll Folds and Accordion Folds.